If you want to receive complete protection for your PC for free, Avira provides its users Free Security and Privacy Solutions. This article will provide readers with basics of Avira Antivirus, Avira Browser Safety, Avira SafeSearch and Avira Connect. They are completely free and provide users with advanced Antivirus, privacy and identity, and management and control features. Avira provides free award-winning protection for Windows users. Avira Free Antivirus 2018 has a simple, intuitive and attractive user interface. Avira Antivirus’ new design helps users wield the power of next-gen technologies with a single click. 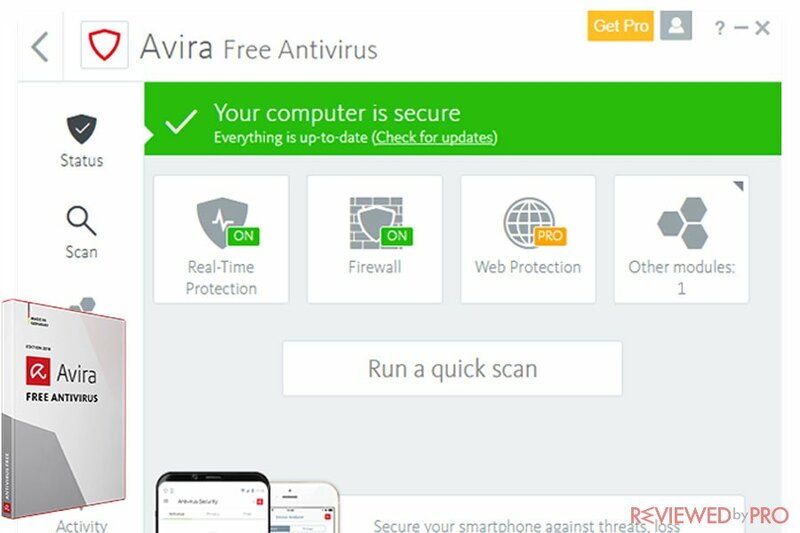 Avira Free Antivirus 2018 combines artificial intelligence, cloud technologies, and an endpoint antivirus scanner. Avira Antivirus protects private data against all types of malicious software, including ransomware, Trojans, and spyware. Avira Free Antivirus offers users early warning system by using Protection Cloud. Avira’s Protection Cloud analyzes unknown files in the cloud anonymously in order to protect millions of Avira customers from malware and other cyber threats as they emerge in real time. How does Avira Real-time cloud scanning work? Firstly, Avira Protection Cloud detects a suspicious file and the file’s digital fingerprint is sent to the Protection Cloud. Then, the file is checked in the real-time cloud against Avira database. Avira identifies the file as safe or infected and the information is returned to the device. Avira Free Antivirus 2018 provides users with award-winning protection against malware. Avira Free Antivirus 2018 scans files in real time for malicious infections and exploits. Avira Free Antivirus 2018 offers users PUA Shield which identifies potentially unwanted applications hidden within legitimate software. Avira quietly works in a background and prevents ad companies or businesses from monitoring your online habits and activities. Avira blocks malicious and suspicious websites before they load and harm your system. Avira’s Price Comparison feature can help you to save money when you shopping online. Avira also offers users Antivirus Pro for Windows PCs that includes next-gen antivirus protection, stops ransomware, guarantees users privacy, offers phone and email customer support, provides premium protection for five devices with a single license, secures users’ online shopping and banking. Avira Pro for Windows also protects networks and emails, provides device control and does not have any ads. Avira Free Antivirus 2018 is compatible with PCs that run Windows 7 or higher, with Service Pack 1 and the latest updates. You also need 2 GB of RAM, over 2 GB of hard disk space and an internet connection. Avira Browser Safety allows users to browse, download and shop online securely. What does Avira Safety offer? Avira Browser Safety improved users’ safety and online experience by blocking all malicious and invasive ads. Users are able to decide whether to display the safe, non-intrusive content. Avira Browser Safety blocks malicious links and phishing sites. This way users are ensured that every website they visit is safe. 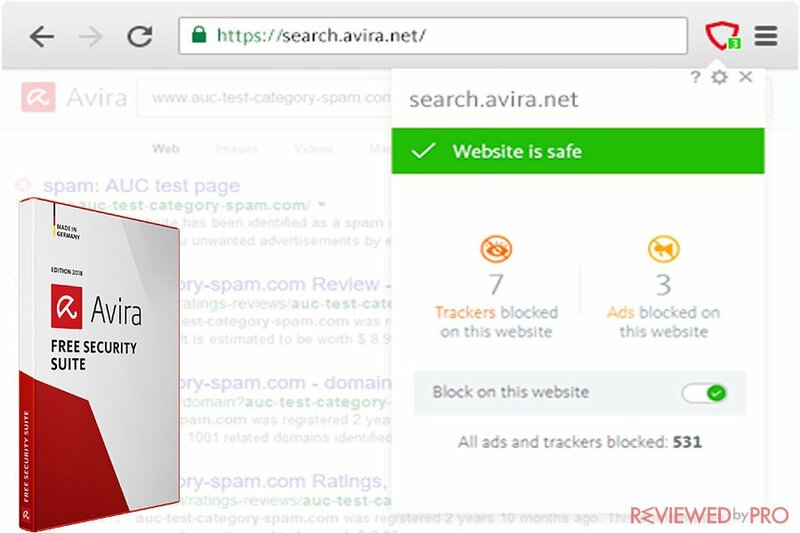 Avira Browser Safety blocks browser trackers and prevents thousand of ad networks from monitoring your online activities including what you search or shop for. Avira Browser Safety alerts users whenever they click on software that contains a potentially unwanted application. It also offers users their desired software from a secure website. Avira Browser Safety allows users to save money by finding the best deal for whatever product they are shopping for. What is more, all deals are listed on safe websites, so users can enjoy the best offer and safe online shopping experience. What does Avira Browse Safety feature? Avira Browser Safety does not allow users to land on harmful websites. Avira Browser Safety does not allow users to overpay when shopping online. Avira Browser Safety does not allow networks to track its customers. Avira Browser Safety identifies hidden programs in download portals and provides users secure alternatives. Avira Browser Safety prevents malicious and intrusive ads, banners and pop-ups from landing. In addition, Avira also provides users with a secure engine, called Avira SafeSearch Plus. The software offers users secure search results, search excellence, and PUA detection. The privacy and identity solution has proprietary URL cloud technology which not only scans websites automatically and in real time, but also provides advanced protection against emerging unknown threats. Geo-specific, which switches results according to a user’s location and language. Responsive, which adapts the size of the search bar, according to a user’s screen resolution. Quick access, which allows users to click the tiles on the homepages to access bookmarked websites. A holistic approach, which extends user’s security to all new tabs. 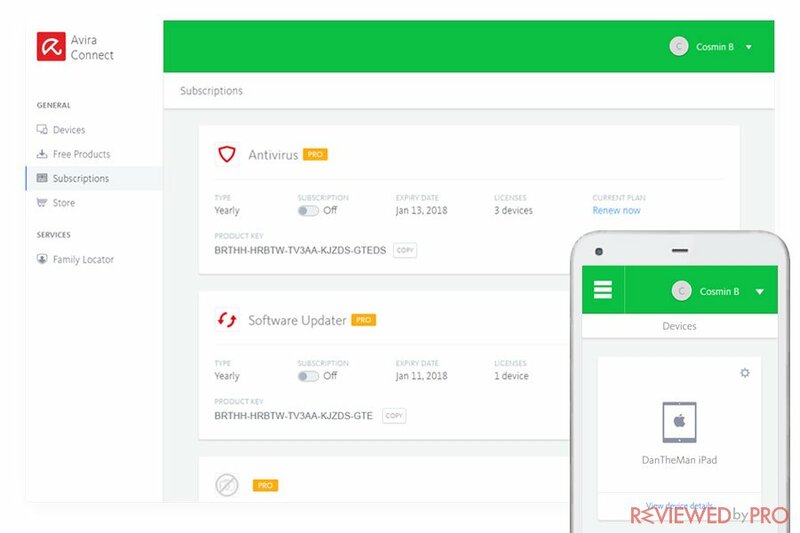 Avira Connect allows users to easily manage their digital life by checking their security status, locate their phone, and manage their subscriptions from Avira online dashboard. Avira Connect provides users with an overview of the latest scan results and security status for all Avira connected devices. Avira Connect provides users with easy access to their protection, privacy and performance enhancing tools. Avira Connect enables users to manage all their devices from one location. Avira Connect supports all of the users’ devices, including PC, Mac, Android or iPhone and iPad. Avira Connect provides a special Family Locator service, that is able to protect users’ phones from loss or theft. Avira Connect allows users to easily manage their subscriptions. So if they want to review a premium security service, or upgrade their software, Avira Connect provides its consumers with easy to use central location, from which they can manage their all subscriptions. Users can get access to Avira Connect only by creating an account! ^ Avira Free Antivirus 2018. 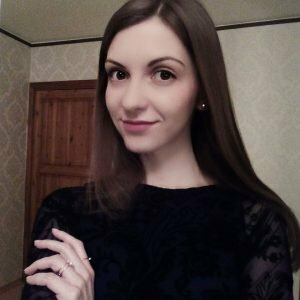 Avira. ^ Avira Browser Safety. Avira. ^ Avira SafeSearch. Avira . This entry was posted on 2018-02-26 at 07:49 and is filed under News.